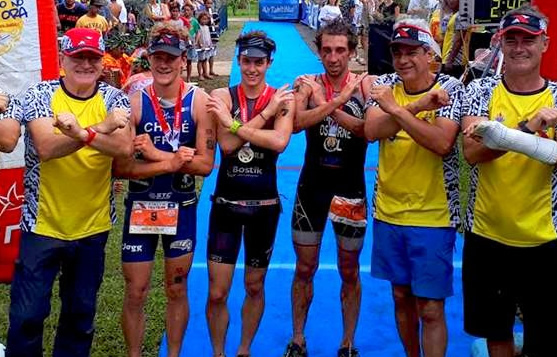 Mauricio Mendez from Mexico and Jacqui Allen from Great Britain captured the fourth annual XTERRA Tahiti elite titles in Moorea on Friday, May 11. It’s the second XTERRA win of the season for Mendez, who won at XTERRA Chile in March, and the seventh major in his career which includes the 2016 XTERRA World Championship. It’s also the second victory of the season for Jacqui Allen, who took the tape at XTERRA New Zealand in April, and it's her second win in as many years in Tahiti. In the men’s race it was chaos from the start with four top-level elites all exiting the 1.5km swim together. Ben Allen registered the fastest split in 18:06, but reigning XTERRA Asia-Pacific Tour champ Sam Osborne was one-second back, XTERRA Cyprus runner-up Maxim Chane from France was four seconds behind, and Mendez was nine seconds back. Of note, it was Chane who posted the fastest bike split of the day (1:37:15), with Osborne just a few seconds back, then Mendez two minutes later. Mendez crushed the run with a split (40:23) that was more than three-minutes faster than Osborne to take the tape in 2:40:09, just 37-seconds ahead of the Kiwi. Chane finished in third, less than two minutes behind Osborne, and Allen placed fourth for the third time in a row on the Asia-Pacific Tour. In the women’s race Jacqui Allen was able to erase the memories of a crash during the bike in Danao that left her unable to finish and shaking her head. It turns out, the rest required from that mishap might have been just what the doctor ordered. “I’m thrilled. I guess a little bit of forced rest does me good,” smiled Allen, who twisted her arm and banged up her elbow and toe in the fall a few weeks ago. Kingsford, who was second to Allen at XTERRA New Zealand, took the early lead on the bike but then the course start climbing. All the while two-time XTERRA World Champ Lesley Paterson was working, but she came out of the water two-minutes behind Allen and lost another two minutes on the bike. “My fitness was just not there today,” said the legendary Braveheart and reigning XTERRA Pan America Tour Champ. First race back or not, Allen knows what kind of competitor Paterson is and was running scared. Allen not only made it to the 5k mark, she made it to the 10k mark and took the tape in 3:12:15, more than two-minutes ahead of Paterson. Penny Slater, the Tour leader, finished in third, followed by Kingsford, Leela Hancox and Kristy Jennings. Kiwi Sam Osborne and Aussie Penny Slater held their leads in the XTERRA Asia-Pacific Tour elite points standings after the third of four events in Moorea today. Should the two travel to XTERRA Albay for the finale in the Philippines on June 17 they’d be the odds-on favorites to take the series title. "100% mate, I’m off to Albay, not going to let the Asia-Pacific Tour go from underneath me," exclaimed Osborne after the race. Ben Allen sits in second with 187 points, followed by McPherson with 143 points. They are the only two in position to surpass Osborne in points should certain scenario’s play out. In the women’s chase Leela Hancox is in second with 169 points, followed by Jacqui Allen with 150 points, Samantha Kingsford with 123, and Kristy Jennings with 116. All four of those women’s are still in the hunt for the overall title.